This how to make a ribbon tutu tutorial is perfect for Halloween or costuming crafts. This no sew ribbon tutu DIY is perfect to use up any extra crafting ribbons you may have laying around or to quickly customize a skirt. Its also fun for play dress up for little girls! I have created a lot of different tulle, how to make a tutu, and hair bow holder projects on Momdot. And today I wanted to show you a really easy one that takes almost no time at all, costs under $6 (or less if you have big craft buckets like I do) and every one will love! This is a must for a dress up play area and an easy craft to create for a girls tea party or glam birthday party. While I made a ribbon tutu with assorted ribbons as shown below, you can customize it with different colors to represent a sports team or glam it up with sparkly ribbons and glitter! If you are wondering where to get that many ribbons inexpensively, you can generally buy a grab bag of assorted ribbons for $3 at Hobby Lobby. Its in the ribbon section and generally on the bottom shelf in sealed bags. Grab two of those. These are all the ribbons in mine! They are also double the length you need so you can cut them in half to create double ribbons. First take your waist ribbon around your subject and tie in a bow. This is the length of ribbon you need. This length will depend on if this is for an adult or for a child so I cannot tell you how long to make this. 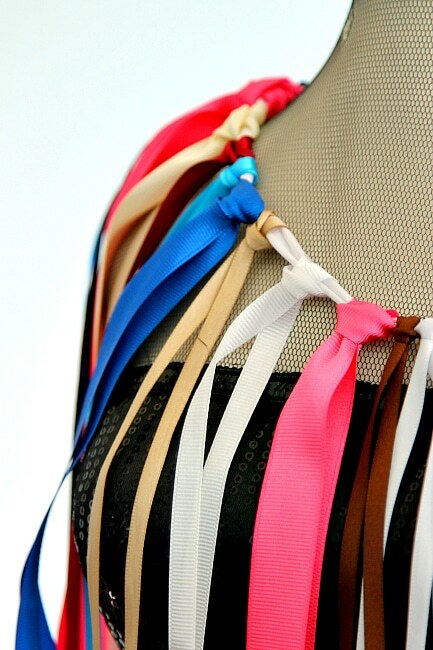 Next you need to take your ribbons and create slip knots to secure the hanging ribbons to the waist ribbon. A slip knot is very easy. Just fold your ribbon in half and put the looped middle section behind your waist ribbon. Then bring up the bottom hanging pieces and slip it through the hole. Pull tight to secure. Now repeat this all the way around! You can choose to fill in all the gaps or leave it with space. The choice is yours! 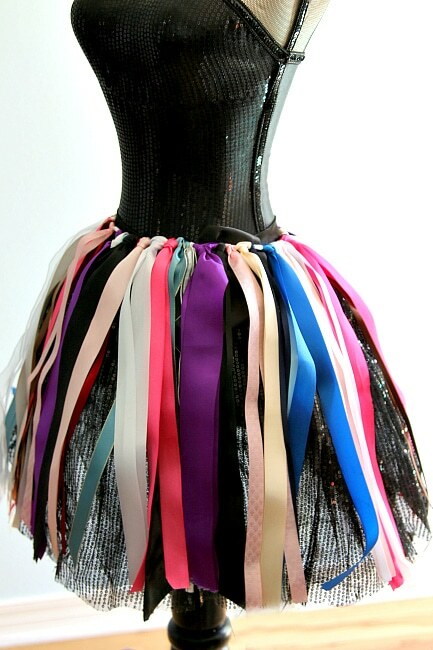 You can also use this ribbon tutu to go over the top of a skirt or regular tutu to bring the glam up. Here is what the slip knots look like all the way around. It’s also good to have an adorable helper. Tada!! To use the skirt, just untie the waist ribbon and retie around your subject. If you have any uneven lengths, you can choose to cut them all evenly or leave longer like a fairy. Also to make sure the ribbons do not fray over time, you can use fray check on the bottoms after trimming. Do not forget to PIN THIS FOR LATER here! Follow MomDot’s board MomDot Blog on Pinterest. I never knew that this would be easy,,thanks for sharing! ah! very cute things! i used to make this one for my little kid neighbors! What a great tutu! And a great way to use extra ribbons you have! Thank you for the thorough tutorial! Thanks for the tutorial! I can’t wait to have a little girl so that I can make her lots of tutus!!! An easy to follow project for my ;little girl to do over the summer. love this, it’s so cute! Cool idea and it would be fun with the kids also. Thanks for sharing. So I completely love this idea but I have two little boys. Would it be over the top if I made this for my friends little girls for birthday presents? So cute!!! Wow, that is so easy. I once tried to do the same but with tule and organza. I had no idea how to do it and it ended up semi decent. My daughter would of loved this when she was in ballet, how pretty!! That is super cute. You have made it look so easy. This is very cute! What a great look! Wow love this, so helpful! 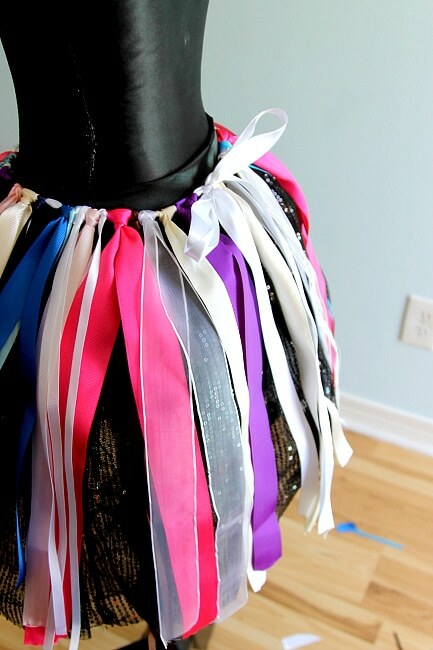 Since tutu’s are really popular now, adding ribbons make it more colorful and much ore creative. It looks super cute and pretty. Also- really easy to make. This is adorable! Any little girl would love this. That is really cute. I have made them out of tulle but the ribbon one looks really cute. What a cute idea and I love the fact that your directions are so easy to follow. Thank you for sharing. How Cute Is This Must Make With My Girls!! Simple and cute! It would make a great present! It’s so much easier than I thought it would be. Very, very cute! Oh it’s so pretty! I love how you can make it in any color scheme you want and I just want to hug your assistant. Really cute! If I had girls, I would totally make this! Pretty awesome. That makes me want to dance! Love it! That is a great tutorial! This would be fun in the summer! I love this style of tutus.. I have tons of ribbon.. this would be a fun project with the girls to do. Saving this, so glad I found this!